It is Iffin Farmhouse’s policy to conduct all of its business in an honest, ethical and socially responsible manner. We take a zero-tolerance approach to bribery and corruption and are committed to acting professionally, fairly and with integrity in all of our business dealings and relationships. 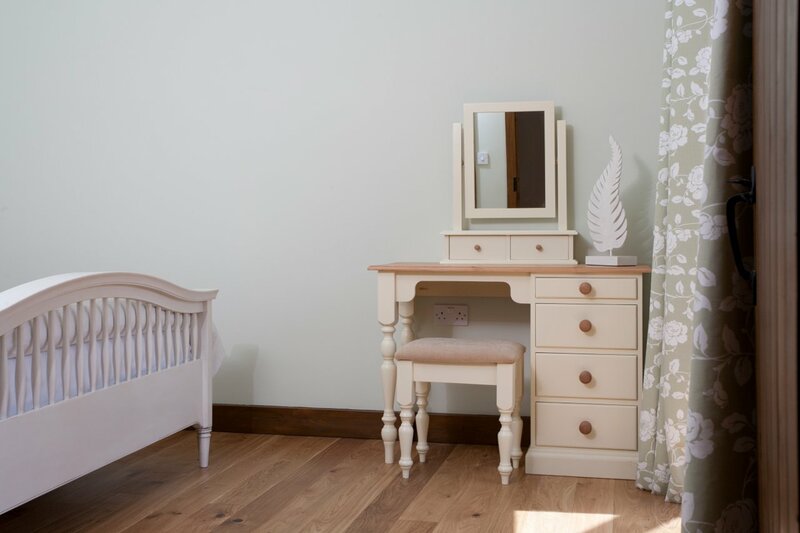 Iffin Farmhouse, as a premises, offers both serviced and self-catering accommodation, it is therefore a legal requirement to keep a record of all guests over the age of 16 to comply with the ​Immigration (Hotel Records) Order 1972​. Iffin Farmhouse will hold any data for as long as it has a legal business reason to do so. The holding and use of personal information on individuals is regulated by the Data Protection Act 1998. 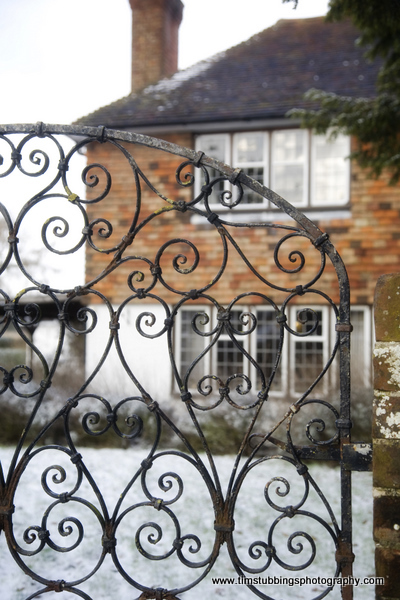 Iffin Farmhouse is committed to protecting the privacy of its guests as a user of its website www.iffinfarmhouse.co.uk​ and the confidentiality of personal information that may be provided whilst visiting the site. Iffin Farmhouse also abides by the Data Protection Act 1998 and complies with its provisions to ensure that any data provided by a guest is treated accordingly. Iffin Farmhouse is committed to protecting your privacy. We will not use our website or social media pages to collect any personal information about you unless you consent in writing to provide it to us. In such cases where we ask you for personal information, it will be kept secure and confidential. According to the contact details provided by you, we will provide the services you have requested by email or telephone. By ‘liking’ our page and/or registering to our website and/or using an application or otherwise interacting with our website or social media pages you consent to the collection and use of the information you voluntarily submit. Thank you for booking your stay at Iffin Farmhouse. We’re looking forward to seeing you, and helping you enjoy your time in Canterbury. Note: If possible could you let us know your approximate time of arrival. Our check-in times are either 11am to midday, or 4pm to 9.30pm. We offer evening meals at £23.70 per person which includes two courses, a complementary glass of wine and coffee. Please check out our current menu for the latest list of meals. However, if you have any dietary requirements or would like to request something for a special occasion please do not hesitate to contact us. 24 hours notice is required for specific meals, but we do offer a ‘meal of the day’ which can be ordered at the last minute. If you are looking for some added relaxation during your stay then why not book a Swedish massage or nail treatment with our mobile beauty therapist? Have a look at the price list and make a booking by emailing us or calling Sarah directly on 07803 840 642. 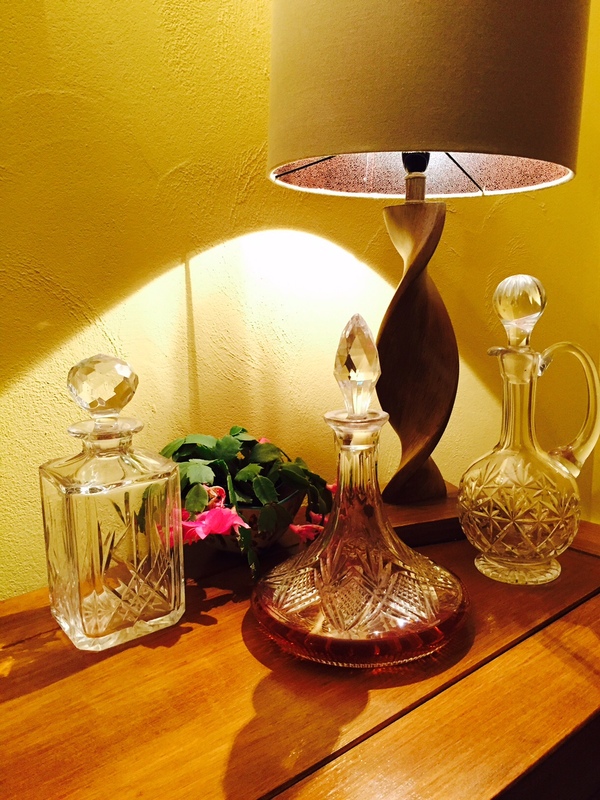 Treatments are carried out either in your room or in the farmhouse. 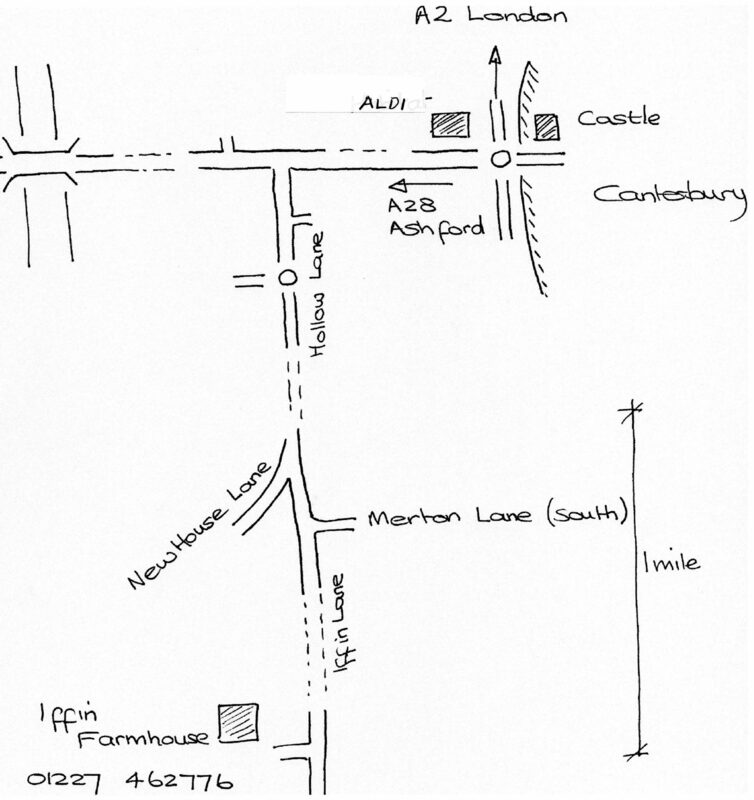 Please also see a map showing the last part of your journey from Canterbury, but for your information if using SatNav it often informs you that you have reached us before you have. If so please continue up Iffin Lane, away from Canterbury. All the houses will stop. Continue for another 800m and there will be a cream bungalow on the right. Go past and Iffin Farmhouse is the next drive. It has a swinging sign. Turn in, go over two cattle grids and park in the car park. Make your way along the loose stone path towards the main house. Check out our sample menus below to whet your appetite. Deluxe family room and deluxe barn apartment connected via conservatory. IFFIN – “The youthful dwellers”. Ithynge 1336; Yffyng 1465. OE meaning youth, young people, junior warriors. Very Little is Known about Iffin farm except that in the early days it was known as “Aethynges”. The name underwent several changes for in 1336 it was “Ithynge” and in 1465 it was “Yffyng”. It is said that Vitalis, a Norman Knight depicted in the Bayeux Tapestry, and who is mentioned in the Domesday Survey as residing at Canterbury, had a daughter, Matilda, who married a William Caevel and they possessed the land later. This William Caeval is probably the man who was Portreeve of Canterbury about 1100 and founded Saint Sepulchres Nunnery in the Old Dover Road. A survey of Iffin Woods done in 1983 when the woods were threatened with destruction revealed the site of the medieval manor which was apparently deserted in the 15th century. No manoral site in Kent has ever been fully excavated and it is hoped that this site will be protected. In May 1945 a Bronze Age burial mound was discovered at Iffin Wood. When excavated it was found to contain several inverted burial urns with a few human cremated remains. They date from 1700 to 1100 B.C. If you enjoy the drama and music of the Theatre when you are on holiday then why not have a look at the list of wonderful performances on offer at The Marlowe Theatre Canterbury. We think our local theatre is such good value and show fantastic productions that we are members. The Marlowe Theatre has a long history connected to Christopher Marlowe, a Canterbury lad born in 1564. The Five Bells Inn – The Street, East Brabourne, Ashford, Kent TN25 5LP – 25 minutes drive into the Kent Downs, on the Pilgrims Way. 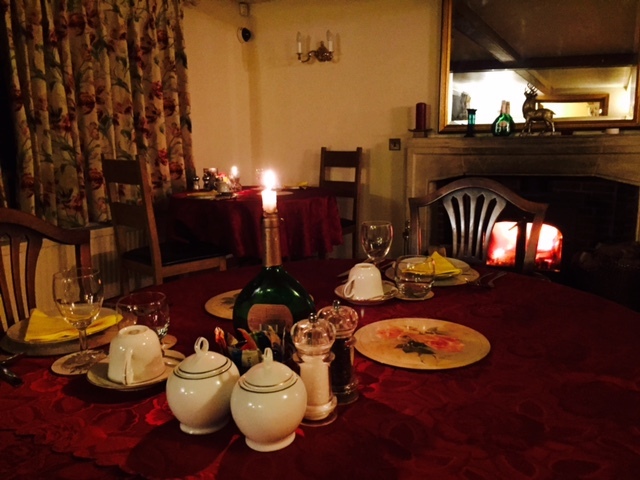 Very busy, but no bookings taken – worth the wait to eat! London and Europe are all within easy reach. 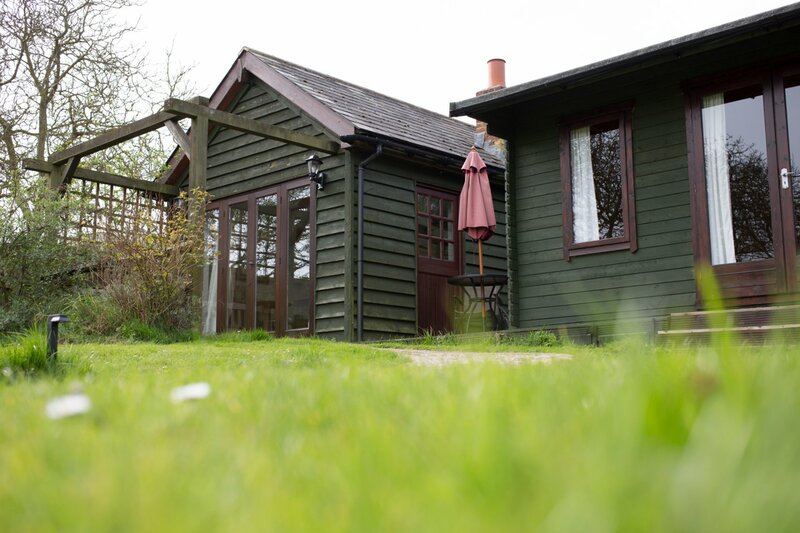 Whether arriving by car, train or bike, Iffin Farmhouse is easily accessible. 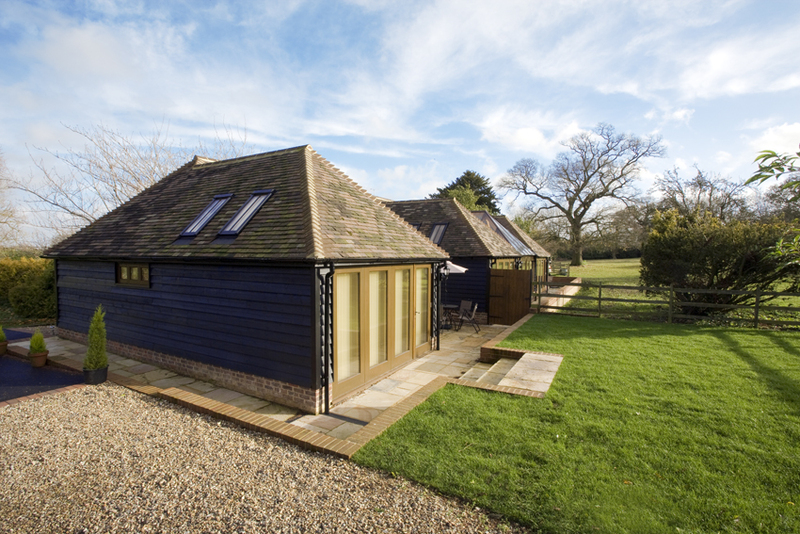 Trains from London St Pancras take just 1 hour to arrive at Canterbury West – a 10 minute taxi drive to Iffin Farmhouse. 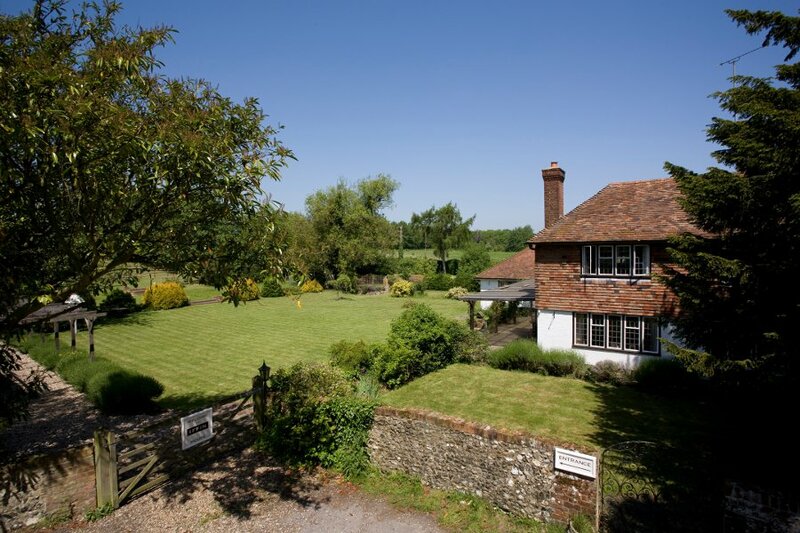 Trains from London Victoria take 1 hour 30 mins to arrive at Canterbury East – a 5 minute taxi drive to Iffin Farmhouse. Trains from Europe arrive at Canterbury West (change at Ashford International). Please note if using Google Maps, when typing in our post code, CT4 7BE, the arrow will indicate a property further down Iffin Lane, to reach Iffin Farmhouse, continue up the road away from Canterbury for a further 300m. The A2 from London to Dover is a 5 minute drive away. Folkestone and Dover are 20 minutes away, with their cross-channel ferries and the Eurotunnel. In the other direction via the A28 is Ashford and the Eurostar station, which takes about 20 minutes by car. 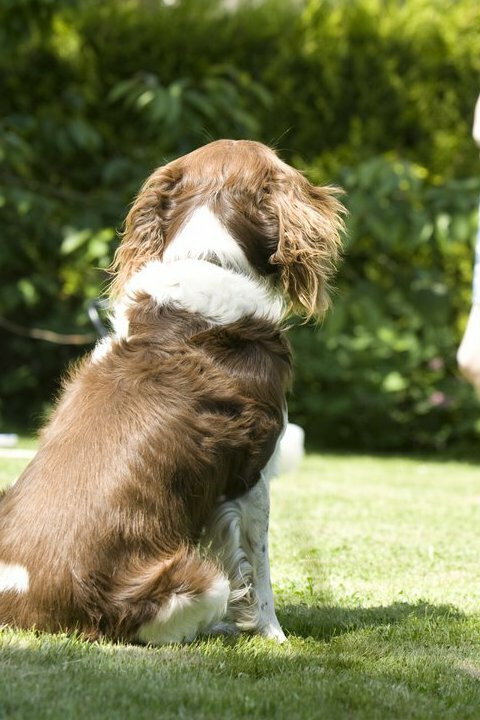 you are more than welcome to stretch your legs in the garden and please feel free to play with my toys. There are gates and cattle grids to prevent you rushing out onto Iffin Lane but take great care if you are of a mind to practice the long jump or squeeze under the post and rail fence without your human with you! 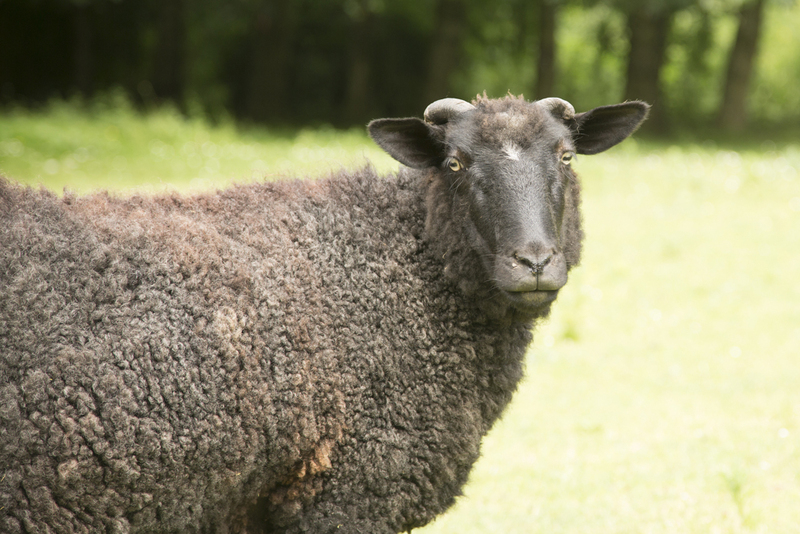 my other animal friends are sometimes in the paddock which you walk through to get onto the lane – please don’t chase or bark at them as their back legs can kick a fair punch! My folks have a large barn for storing your cage if you need. 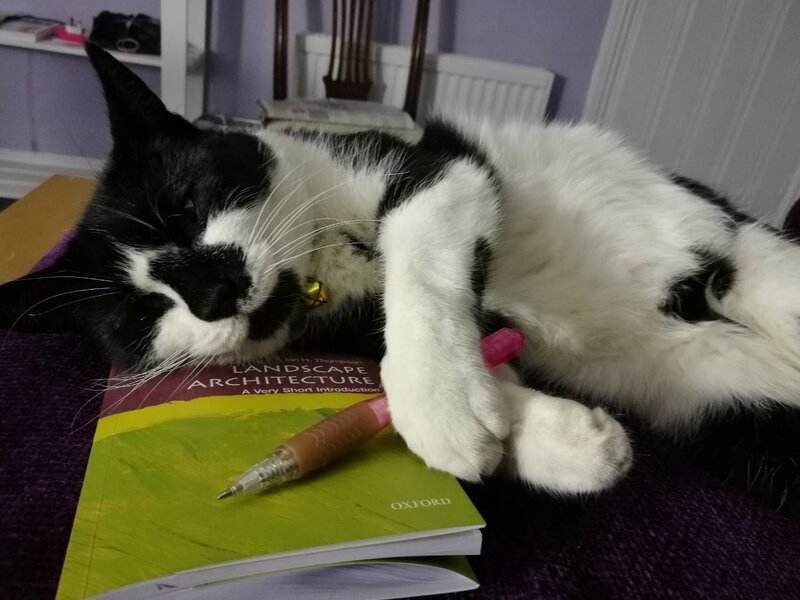 If you have forgotten to pack your bowl, bed, lead (that’s the usual one!) or food let me know and I will find you one. If your folks haven’t enough room in the car to pack your food, bed, etc let me know in advance and we can arrange to have it provided at a small cost. In the event of accidentally breaking/damaging something through holiday exuberance please either replace it or let my folks know so they can sort out a replacement. Please don’t feed me as apparently I’m on a strict diet! 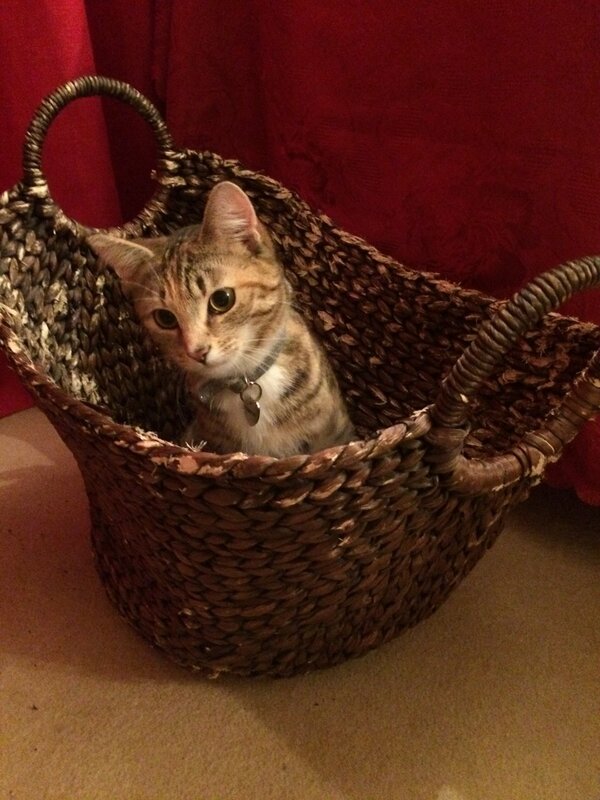 I would like to introduce my girlfriend Goldie who we have sponsored. 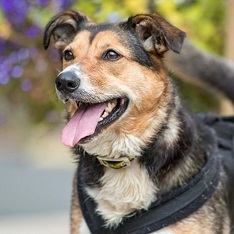 She is a beautiful Collie Cross and she lives at Dogs Trust. Click through for more details and to view availability. 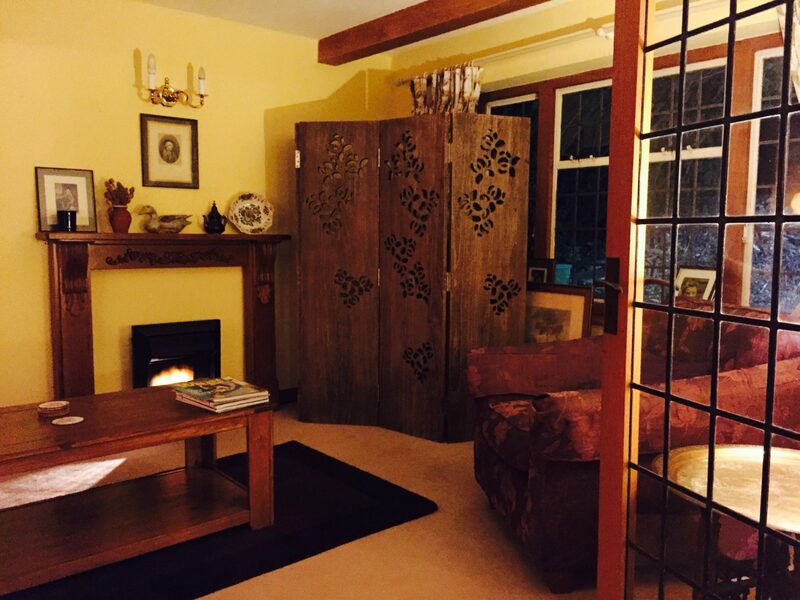 A delightful ground floor room overlooking the garden with dual aspect windows. 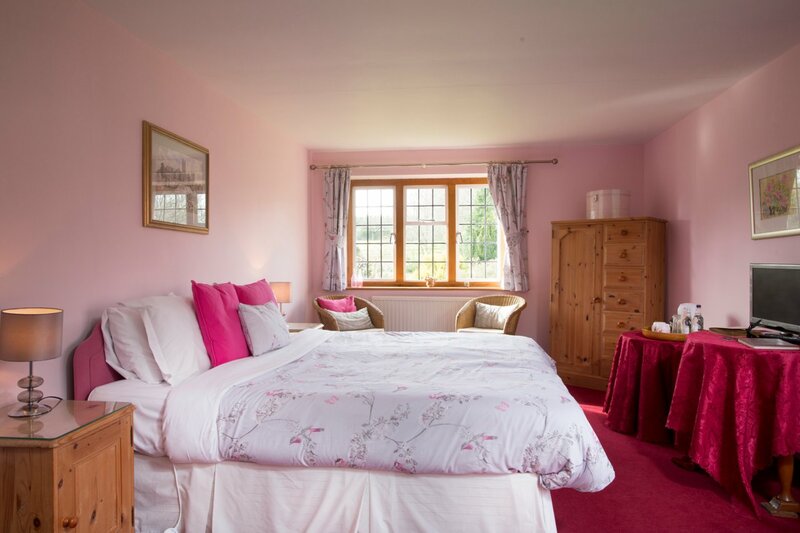 A spacious suite with a double bedroom, large wet room , 2 single beds, & lounge area. 2 further beds available on request. 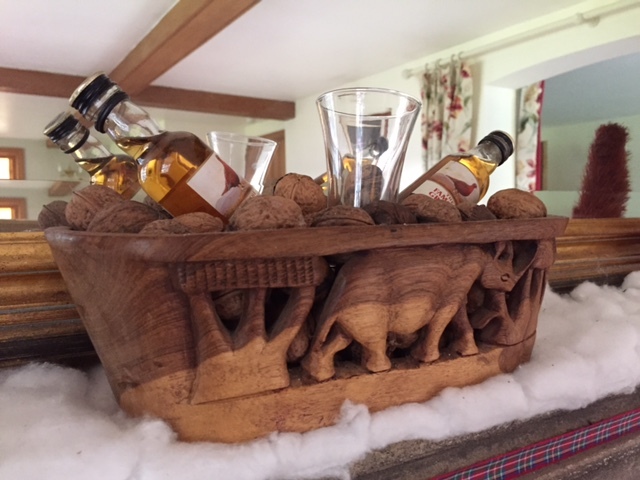 Iffin Farmhouse is available to hire for large groups, with a capacity of up to 24 people. Ideal for wedding parties and other celebrations. Not sure which room you want? Search for availability on your preferred dates across all our rooms. We can recommend suppliers for marquees, catering, florists etc. Provide some event details to help us understand your requirements. 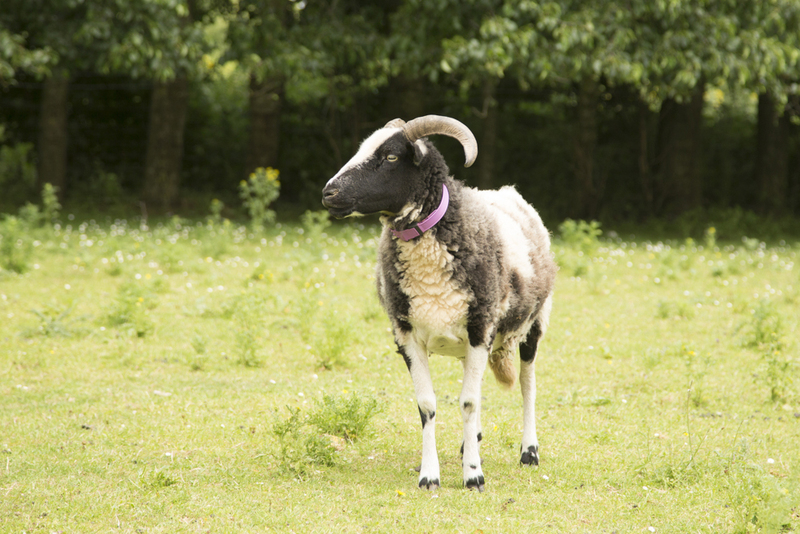 Our beautiful countryside location, just outside bustling Canterbury, allows us to keep a range of domestic and farm animals. 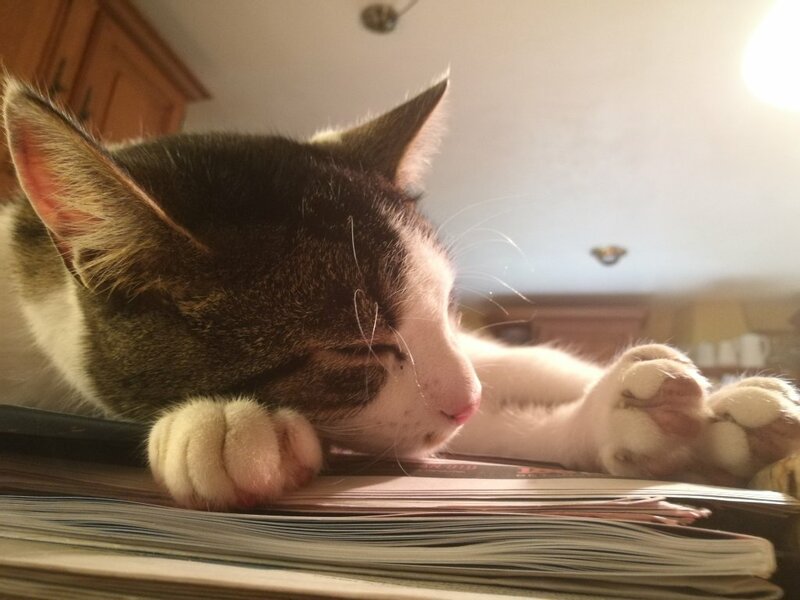 Some are pets, the others seem to tolerate us in return for regular food and water. We think they make a stay at Iffin just that little bit more special. If you have any questions you wish to ask before making your booking please do not hesitate to call us on +44 (0)1227 462776, or complete the contact form to email us. We do have them and you might too. 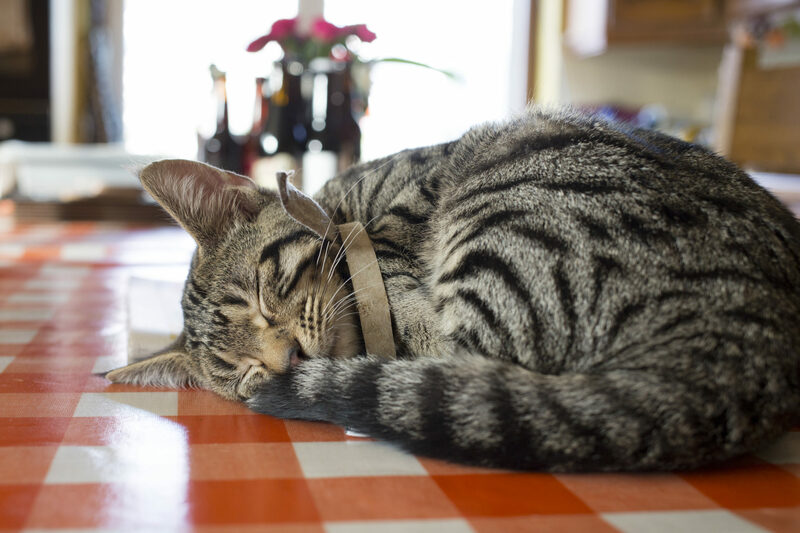 You may even be temporarily adopted by one of our over friendly cats! They are our pets but as with any animal they can be unpredictable so please respect that this is their home. 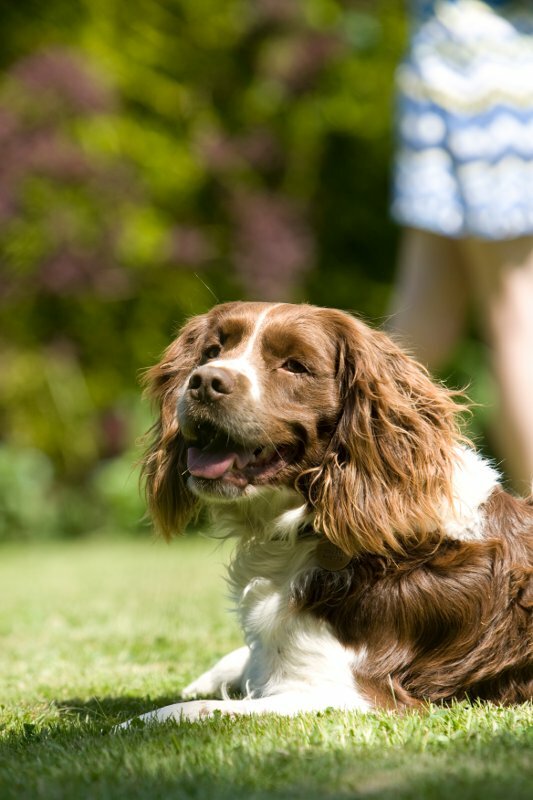 Please note that here at Iffin Farmhouse we have a variety of animals including dogs, cats, sheep, ponies and chickens. While all of the animals are very tame, they are wild animals and can be unpredictable. Please treat them with respect and take note of barriers and fences- they are there for a reason.We will not take any responsibility for accidents that take place where boundaries have been crossed. Please also let us know in advance of your stay if you have any allergies as these will be taken very seriously. Iffin Farmhouse is located on Iffin Lane, a small country lane. Access into the main drive is sign posted by a high level swinging sign board. The drive opens out on to a paddock and has two Cattle grids, one at each end of the drive. On foot access is possible via gates either side of the cattle grids. The drive is approximately 80m and opens up on to a gravel Car park. For disabled access there is a tarmac parking bay with ramp that leads to our other disabled facilities. The entrance to this facility is just 15m from the car park. From the car park there is a gravel path down the side of the Barn (follow entrance signs) approximately 30m. At the end of the gravel path is a single step on the left hand side with a drop of 18cm (also with a wooden ramp), follow this path 25m to the front door. There are two wooden doors. The one on the right hand side is the main house where you will be greeted and shown to your room. All paths are well lit with motion sensor lights. If you are unsure please call the farmhouse and someone will be happy to meet you on the drive. The breakfast room is situated in the main house and can be accessed by two white framed glass doors by the front door and is approximately 45m squared. There is one step of 22cm then the room veers to the right. There is one large table 120cm by 340cm and two smaller tables with the addition of a table at the side with cereals, yoghurts and fruit. At the back of the dining room there is a living room area that is publicly available to all guests. A toilet room can be found at the rear of the property on the ground floor. It is easily accessed through the cloak room and has just a toilet and a sink. The barn is located next to the car park and can be accessed via a tarmac path leading to a flat paved path. Double doors for wheelchair users or families with push chairs can be easily opened using the clasps at the top and bottom of the adjacent door. There is a small lip of 2cm over the threshold but ramps are available if this is problematic. Once inside this is a one storey barn conversion (54 square meters) with a fully working kitchen with adjustable work surfaces for wheelchair users, a wet room with built in shower chair and hand rails, extra wide doors and walk ways and a double bed of height 53cm. 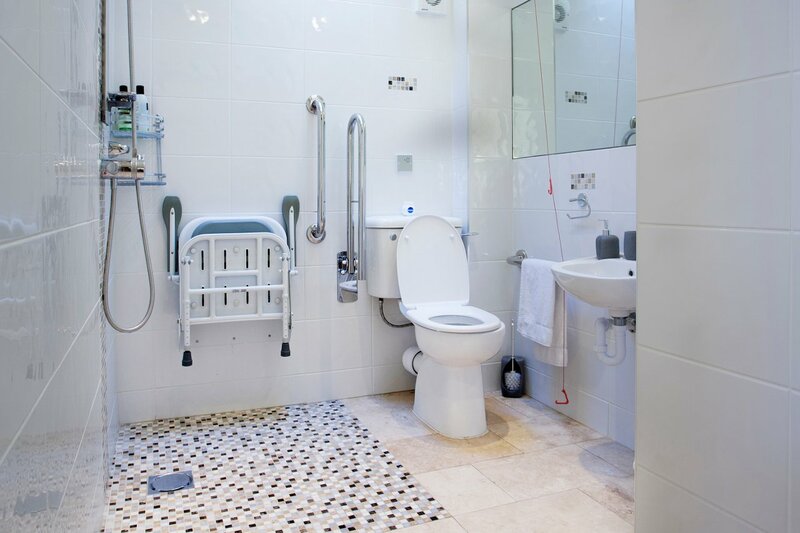 There is also an assist alarm in the bathroom which is connected to the main house in case of emergency and a bell in the bedroom to alert people if there is a problem. 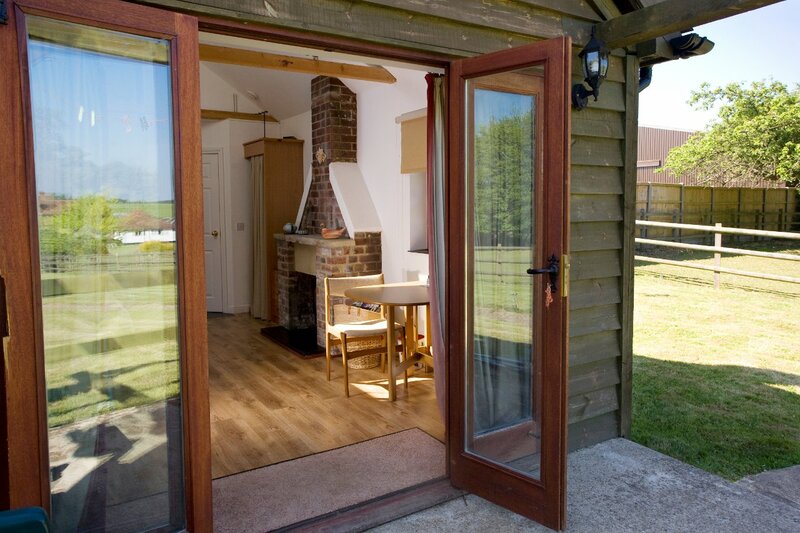 If access to the breakfast room is not possible then breakfast can be brought to the barn unit on request. Access to the breakfast room is possible by following the paving along the side of the barn which carries on all the way to the main house. 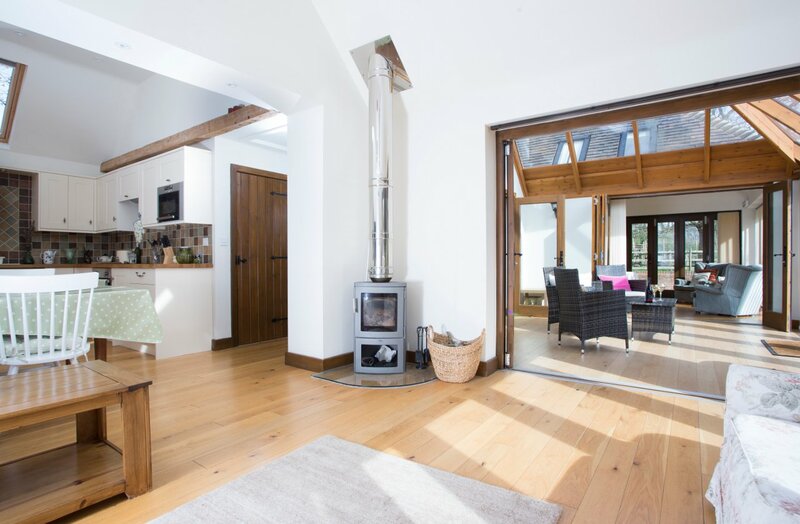 Barn two is located in the middle of the barn conversion which is a single storey unit, accessible via the paved pathway that follows on from the access to Barn one. The main entrance to barn two is accessed via a single door that sits on a step of approximately 25cm which opens into the main living area. 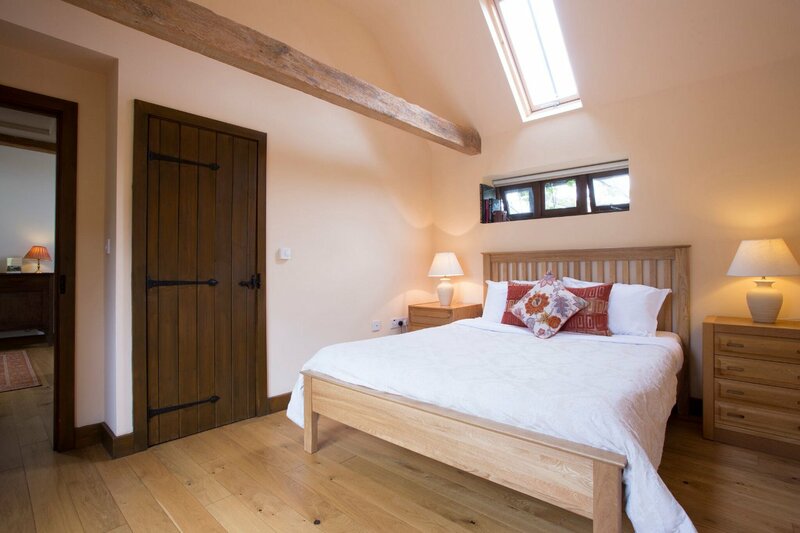 The barn unit is approximately 54m squared and has one wide corridor to access the one bedroom and bathroom that is contained within the unit. The bath/ shower unit is fitted with a suction door that allows the user to get in and out with ease but to also fill the bath. 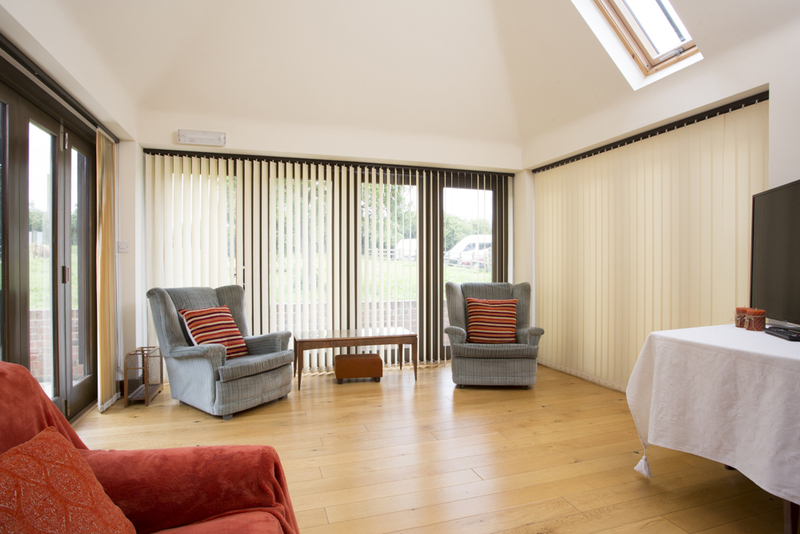 There is two outward opening doors in the bedroom which lead to a shared conservatory area which itself has outward folding doors to the paved pathway outside. 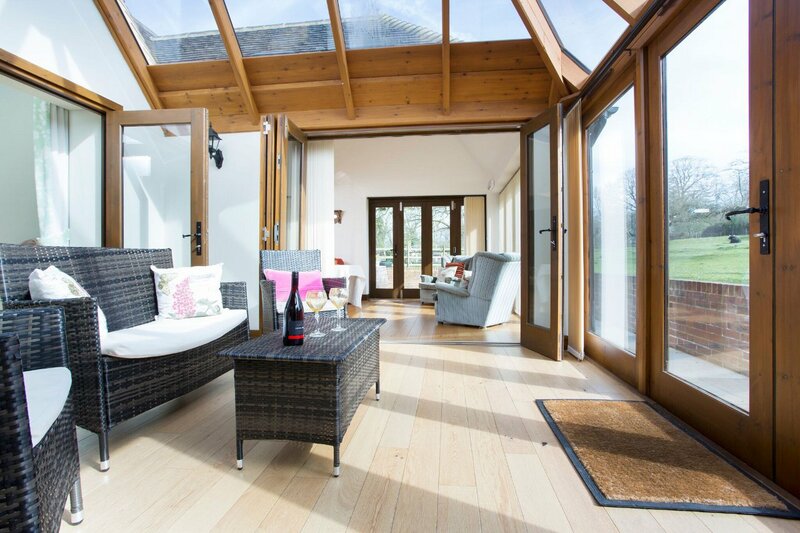 The conservatory can also be accessed by two outward folding side doors in the main living area. The dining room can be accessed via the paved pathway past Barn unit 1 and down towards to the main house- following the entrance sign on the five bar gate. The Orchard Pickers Cottage is at the end of the garden by the car park. It is accessible via an uphill winding pathway through the garden. Approximately 50m walk from the car park. 100m walk from the main house and breakfast room. It has a small lip through the door of 3cm, the rest is all one level. The cottage is small (21m squared) has a basic kitchenette (190cm by 170cm) with oven and grill, microwave, sink, kettle and crockery. There is a small wet room with toilet, sink and shower (150cm by 130cm). The king sized bed sits in the middle of the cottage with a wood burning stove at the foot of the bed, there is a small walk way between the end of the bed and wood burner (35cm) which allows you to access the kitchenette and bathroom. There is also a reasonably sized summer house adjacent to the cottage which is accessible by three wooden steps and houses a sofa, chairs, a book case and a TV/ DVD player. The annex houses two rooms, a standard en-suite double and a twin en-suite. It has a separate entrance to the main house which allows access to both rooms via a lobby. To access the annex there is one step of 17cm and a small lip on the door frame of 3cm. 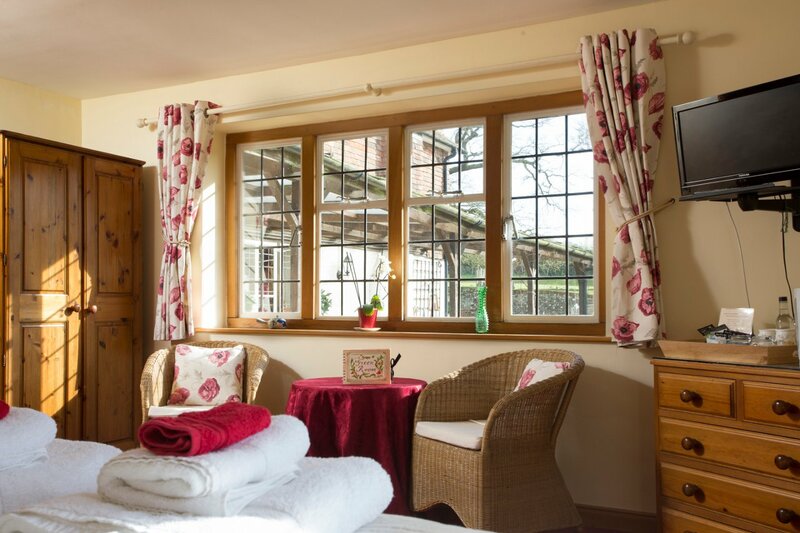 Both rooms are single storey and have two sets of fully opening windows overlooking the grounds. 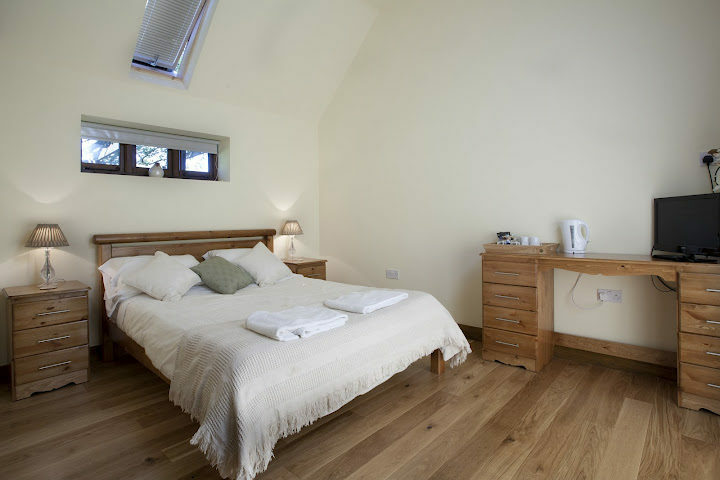 The twin room is 35m squared and has two single bed of height 65cm (twin beds can also be made into a Super king bed). 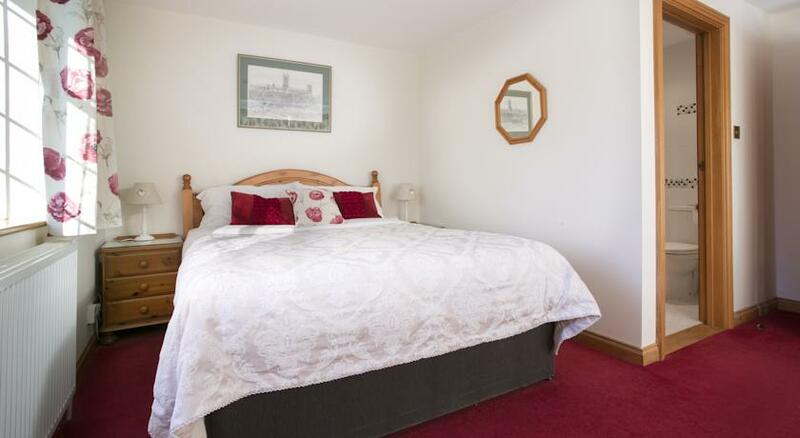 The Double room is 25m squared and has 1 double bed of height 65cm. 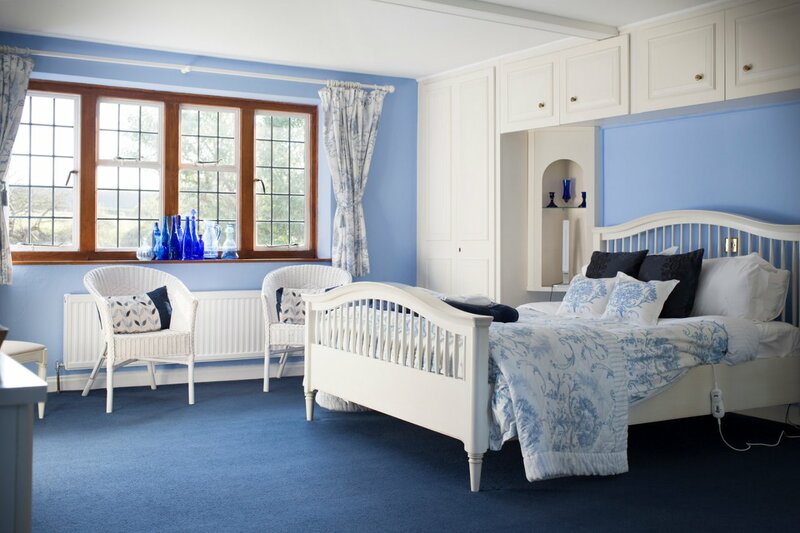 The blue room is in the main farmhouse and is on the 1st floor. 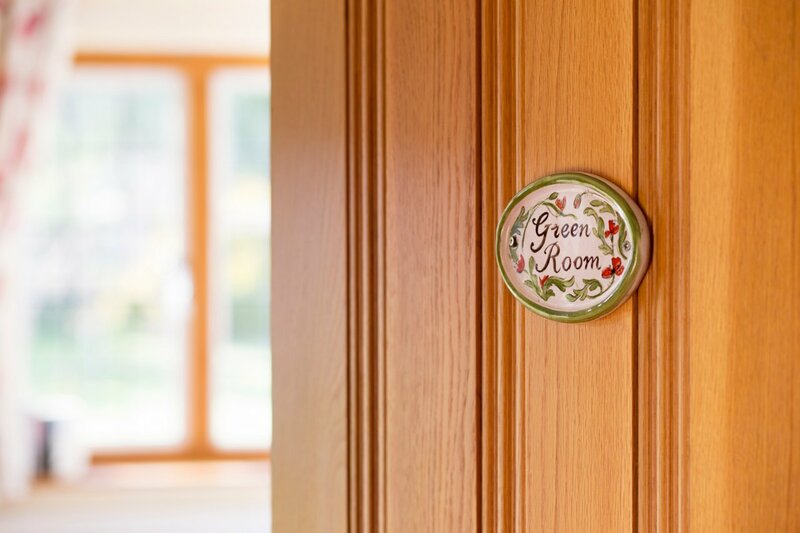 This can be accessed via the breakfast room going through the hallway and up the stairs. There is one step into the breakfast room which is 22cm and 14 stairs, each one 16cm. The room is 39m squared and has a king sized bed 65cm in height. This is an en-suite room with a spa bath- no shower, sink and toilet. 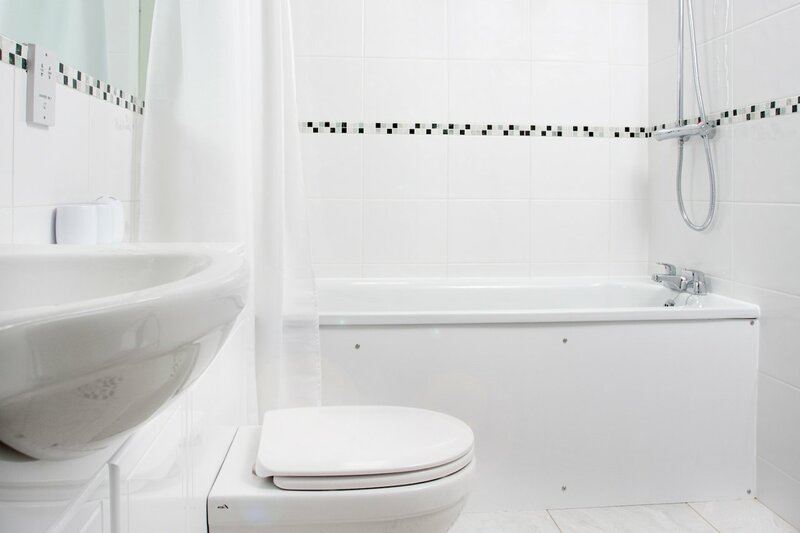 The spa bath has one single step to assist with access and a bath mat is provided to prevent slipping on exit of the bath. Please be aware that the farmhouse is approximately 80m from the car park and can be accessed via a loose gravel path. A trolley can usually be found in the car park for luggage and our staff are always on hand to help carry bags to your room. Self-catering is also an option for this room. Converted orchard picker’s cottage. Small but fully equipped with use of adjacent summer house with double sofa bed. 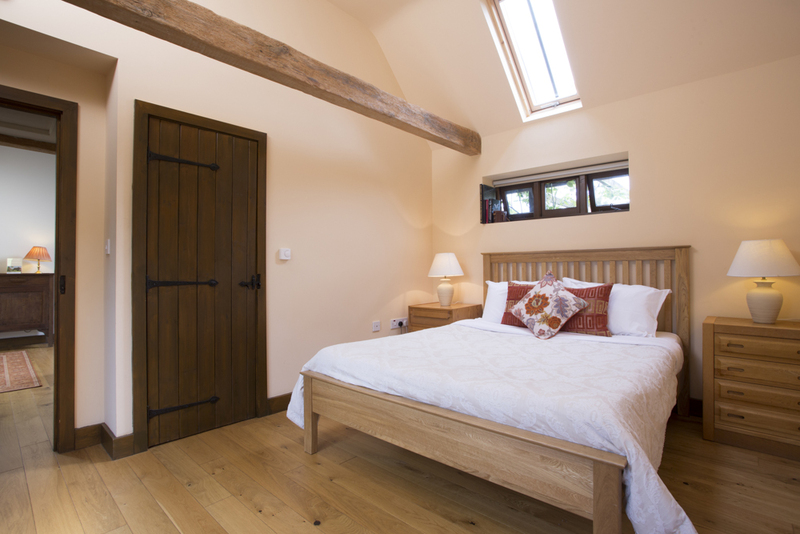 Our converted Barn unit is ideal for family escapes, a get away for couples or just a luxury stop over. The little Orchard Pickers Cottage is nestled in a corner of the Iffin Farmhouse gardens and provides comfortable accommodation for one or two people. 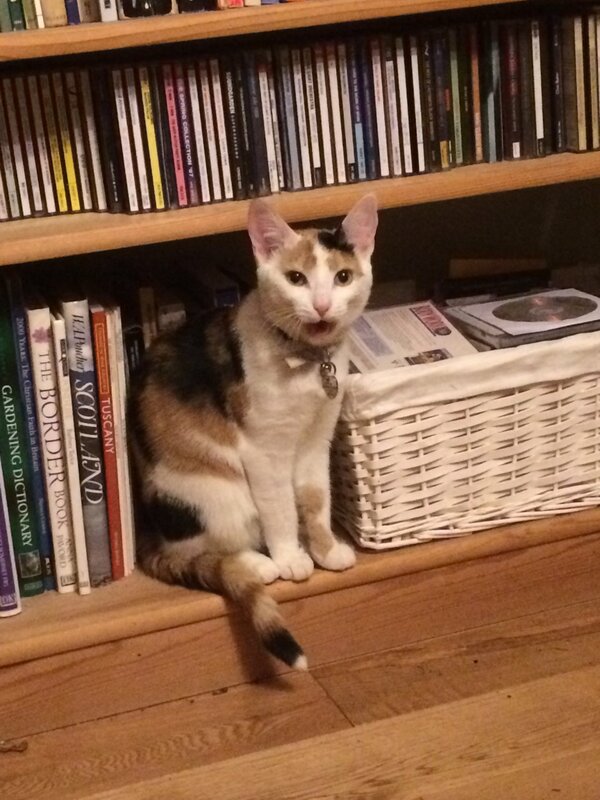 Sorry, we are not currently taking bookings for this room. 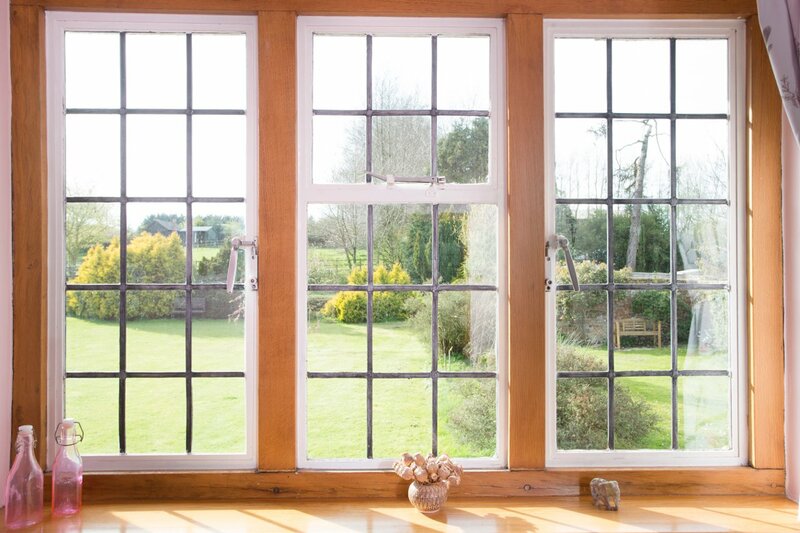 Spacious ground floor room overlooking the garden with dual aspect windows. 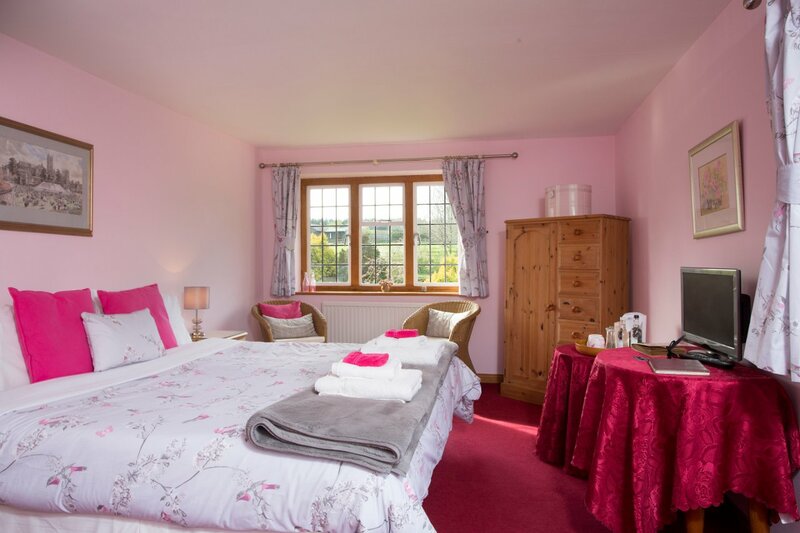 With a comfortable king sized bed, tea and coffee making facilities and en suite shower room the Clssic Double offers everything you need for a short stay. 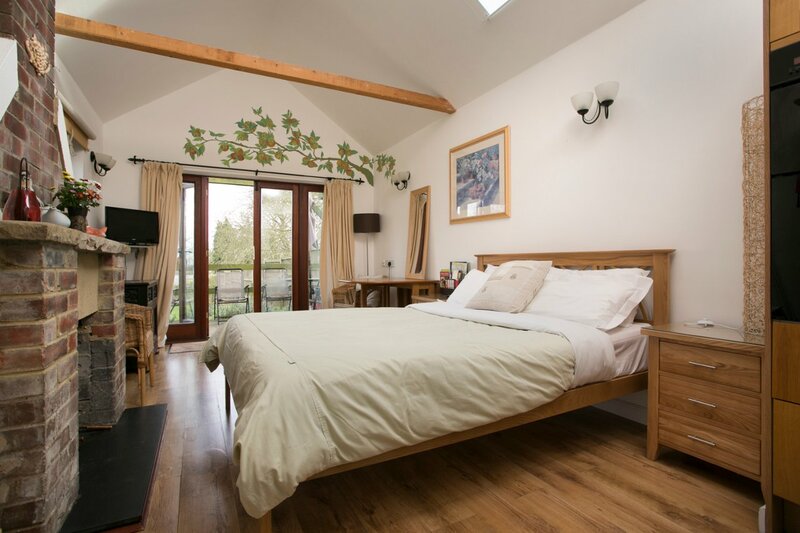 The Superior Double really lives up to its name – a traditional farmhouse room with superking bed, (or ziplock twin beds) plenty of space and en-suite bathroom with separate bath and shower. 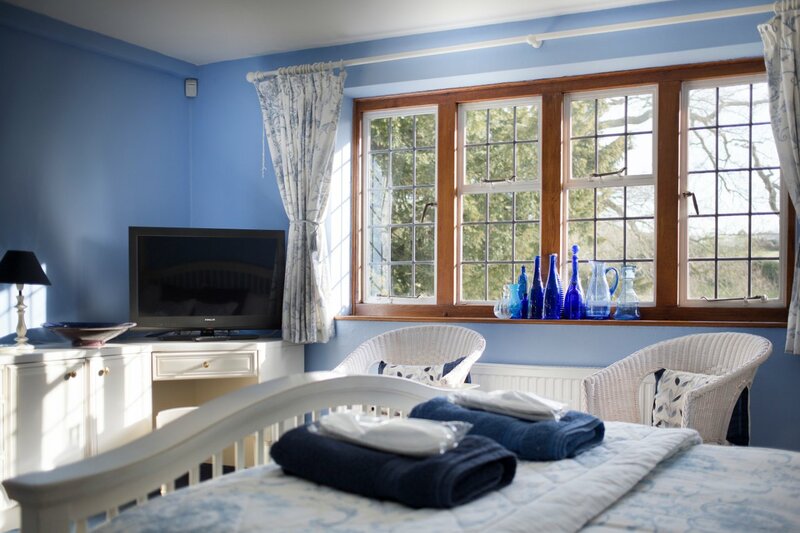 Our traditionally decorated Luxury Double room boasts luxury with a spa bath, soft fluffy towels, bath robes, slippers and Neals Yard organic toiletries.